Please join us November 3rd to meet our students and horses! Join us to meet the students and horses! Enjoy Happy Hour and raffles! This is a free event. Please RSVP by October 13th! Come along as we harness the power of horses to transform lives. Our partnership with the Cleveland Mounted Police Unit allows us to offer inner city kids unique equestrian experiences that build character and self-confidence while teaching responsibility, compassion, and trust. We are LUCK, and we want to show you what happens when a kid meets a horse. It’s who we are and what we do. LUCK is more than just a fun after-school activity (although it’s good for that, too!). LUCK students enjoy the program. It’s something they can look forward to! Donations are vital to our organization. We are a registered 501c3 non-profit. It’s the donations from people who care about are what keeps these kids working with horses. We are happy to have your support in any form, in any amount! Our events allow students to learn valuable equine (equine means horse) related skills. Farrier clinic: a farrier keeps the horse’s feet, called hooves, in tip-top shape. Veterinary clinic: a vet keeps the horse in a healthy condition. Braiding clinic: braids in the horse’s mane and tail give them a professional appearance at shows. Photography clinic: photographers are very well respected in the horse world – everyone wants more pictures of their horse! Have an idea for an event or want to offer a teaching opportunity? Email us at info@luck4kids.org! 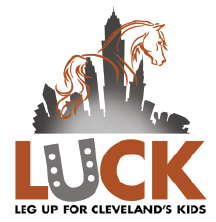 Leg Up for Cleveland’s Kids, known as “LUCK,” addresses multiple challenges facing Cleveland’s vulnerable youth. A shortage of extracurricular and career-readiness activities, coupled with strained relations between community members and authority figures, negatively impacts young people’s ability to create viable and sustaining futures. Through riding and caring for horses, program participants acquire valuable job-training and social-emotional skills that prepare them for success. A partnership with Cleveland’s Mounted Unit offers unprecedented collaboration and community engagement, while immersion in the equestrian industry allows Cleveland youth access to previously unreachable social capital and career pathways. LUCK seeks to positively contribute to the development of Cleveland’s youth through equine activities. LUCK envisions a generation of empowered, educated, and self-motivated young adults who demonstrate empathy, critical thinking, and commitment to personal growth. Daily interaction with horses and adult mentors creates consistent, caring relationships, enabling participants to become confident, capable, healthy and engaged citizens.